a nice pic.. has a happy feel.. I like the lines you drew. They look kind of like they contain the shading within themselves, and, while the van is not unrealistically drawn or anything, it doesn't look like it came completely from "our world" - like it's on a different level of "happy" than everything else. Which makes little sense, but it does make me enjoy looking at this van, which must be a good thing. And I agree with you, about only wanting to drive a VW van. It's absolutely my dream vehicle (although I want to get one and paint it psychedelic myself). And now I'm thinking of a very similar van that I see everyday on the drive to school. It always drives by, and I always think of Little Miss Sunshine (which is a funny coincidence, because I first saw Little Miss Sunshine at school, in my screenwriting class). I hope you know what you are doing with these old buses, the air-cooled boxer is finicky at best and you pretty much need to be a mechanic to keep it going. I feel the same way. 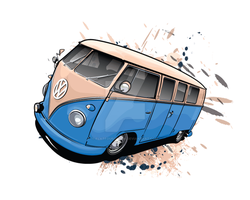 I looove VW Buses. The only car I want. i adore little miss sunshine! and i sooo love this :] i'm soo going to print this out and put it on my wall good job! damn dude, i really dig this. Mmmm my favorite car. And a damn good representation of it! Although my color of choice is earth-green. That is my favorite car ever, and you did a beautiful rendition. The subtle background makes the drawing even better. You must live a charmed life, sir. Wow, I love this. ;D The long space just makes it look cooler. 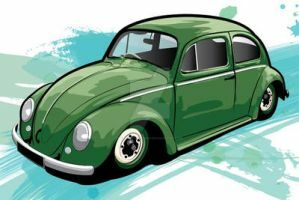 I love all Volkswagens, especially buses (even if my classic light blue beetle with a smiley face license plate did end up being sold )and I love Little Miss Sunshine. Great perspective and great work. dream car This pic is aweome. This is beautiful. Amazing work. I have always wanted on of these in green! Green? that's an interesting choice! i especially dig the erased perspective lines. jk, i frickin love this. cool!!! i love the yellow! I love the orange in the background . . . it looks like buildings to me, I don't know why. But this is super, anyway! Thanks, it used to be really elaborate, but I decide to tone it down a bit. I'm much happier with this version. I hope you've saved a lot of money cos they cost loads. Nice use of perspective thar. Perspective's way more fun than videogames once you get used to it! heheh, the VW can be the honeymoon vehicle!